Fine African dining. Probably the best African Restaurant In the UK. Qual;ity decor superb ambience splendid Cuisine. Traditional Asian setting with a Western Flair. The setting is Classy and Authentic yet Cosy and Comfortable. The perfect venue for families and friends. 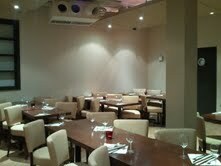 1st Floor Main Restaurant: Full A La Carte & Set Menus available. Complimentary vegetable platter is given with olives and bread. Turnaround around approx.. 1.5 hours. Mouthwatering chargrills, seabass, prawns, Argentinian beef chorizo sausages as well as cocktails from around the world: Metro Bar & Grill has something for everyone.